If you’ve ever wondered how to spray paint glass or were curious about a spray paint for glass that looks like terracotta, then this upcycling idea and tutorial is for you! 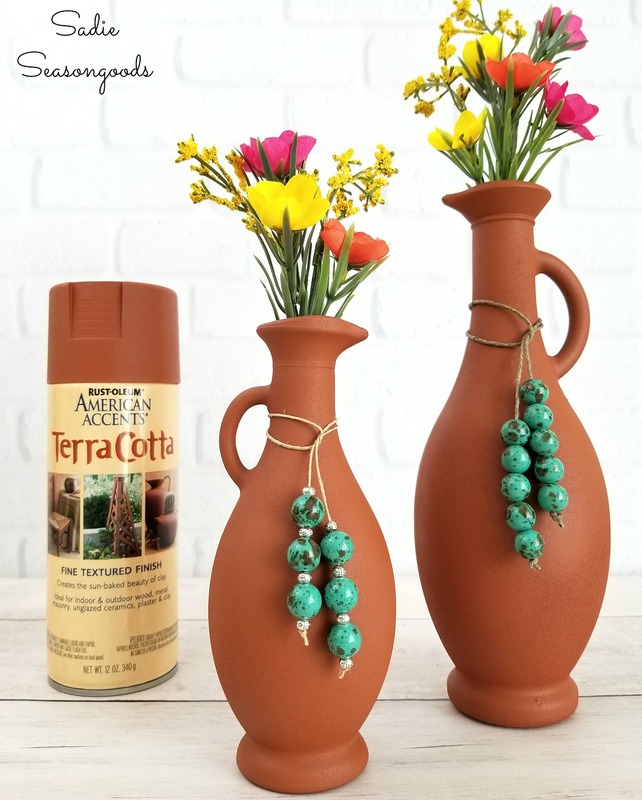 I’m testing out some terracotta spray paint by Rustoleum to see if I can create a realistic terracotta vase that I can use as southwestern decor or even Boho decor. A little background first, though- this all started when I was cleaning out my under-sink cabinet in the kitchen and I found these three olive oil cruets that I had saved. The store that had supplied them closed, so I couldn’t go back and refill them- but me being me, I also didn’t want to toss them away (remember, there’s no glass recycling in my county anymore). Painting glass is something I do a LOT of (specifically spray painting glass) but I wanted to try out a new-to-me product, and this terracotta spray paint seemed like the perfect thing to use on these glass cruets. My plan for these glass cruets? Three different variations of the same end result, all using the same spray paint for glass…allowing me to compare/contrast, and determining which combination of products works out the best! This post contains affiliate links for your crafting convenience. White primer + Terracotta spray paint + matte topcoat spray. My goal? To determine how well the terracotta spray paint adheres to the glass (i.e., is primer necessary?) and how durable is the terracotta paint alone (i.e., is a sealant necessary?). And, as with nearly every spray paint project, I used my trigger grip/handle. Otherwise, I get terrible carpel tunnel / wrist pain from painting glass the next day- this prevents that completely! The good news? No matter which variation of painting glass that I did, each terracotta vase looked and felt the exact same- thank goodness I had labeled the undersides with painter’s tape to keep them straight! The bad news? Well…there is none. There’s only…better news. For instance, I did a scratch test using my fingernail…and all three cruets responded the same. Yes, I was able to make a mark after some vigorous scratching, but above all, there was no difference whether I used a primer or topcoat spray or both! Even though I don’t have any sort of southwestern decor in my home, I honestly LOVE how these turned out. The color is pretty good (maybe a bit dark? ), the texture is just gritty enough to feel like a terracotta vase (not a flower pot, which is more chalky-smooth…think of a slightly sandpaper-y terracotta urn or jug), and the value is excellent. 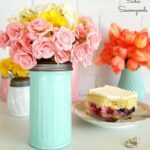 I styled my southwestern decor / boho decor vases with faux-turquoise beads, hemp cord, and faux flowers that reminded me of portulaca. Don’t those look splendid? I graded this terracotta spray paint an “A” and would definitely recommend it to anyone wondering how to spray paint glass and/or looking for a spray paint for glass that looks like terracotta. In other words – I love this spray paint for glass! However, I didn’t try this on something plastic, metal, or wood- so I don’t know how that would fair- therefore, my “A” grade is limited to glass objects. I hope this was a fresh new take on a Sadie Seasongoods’ blog post!! Let me know what you think…and if you have ideas for products you’d like to see me purchase, please send those suggestions along. If you try out this spray paint for glass, please let me know how your upcycling project turns out. And if you’re looking for even more upcycling ideas, please check out my full collection of projects here before you go! I’m always looking for new paint/methods, and I hadn’t heard about this paint yet. Very useful post, and I hope to see more, along with your recycles. Thanks. Thank you so very much, Sammi! I definitely think this type post would be helpful, ESPECIALLY for those of us who are not full-out crafters and just want to get a job done right the first time. Thanks, Sarah! Awesome!! Thank you so much, Rita! I love this idea! I probably would have never tried this paint but with your review I will. I have the perfect project just waiting for it! I think you will seriously love it! As always , a very pretty and easy project. Very nice. I like the idea of test driving different products. And terra-cotta paint? That’s a new one for me! It looks real enough. Cool. I love the test drives! Great idea. Looking forward to more. Awesome! Thank you so much, Karen. Sadie, I would Love it, if you would take the time to do this for me, and others…………. Thank you so much, Linda- your comment means the world to me, as it re-enforces my idea to do these blog posts. I love the new approach! It’s great to get your take and tips. Thank you for the review. I like this product’s potential. You are very welcome, Carla! Excellent idea and post! Thank you! Thank you so very much, Charleen!! Thanks for all the wonderful info on this paint. I have not heard of the Terracotta paint. I can’t wait to find it & give it a try! Do you think the paint would work on plastic as well as it did the glass? I can’t say for sure, but I don’t see why not! Definitely worth trying. Super idea! I love the look of terracotta and to get something in the shape I might like is hard or expensive. Thank you for giving me lots of ideas. P.S. I can’t believe the US doesn’t recycle glass – what up? Honestly, I think this has been out for a while?? But I’m not 100% sure…and it’s just my neck of the woods that stopped glass recycling. Most of the US still does, but it is becoming a bigger issue elsewhere- it’s cheaper to make new glass than recycle it, so it’s a supply/demand problem more than anything else. I would love to see more “test drive” posts! I enjoyed this one – the cruets look awesome, especially with the green bead decoration. Lovely. Thank you so very much, Beverly! This is very cool! I cant wait to try this paint! Thank you! I do hope you continue doing product test drives! I think this is a terrific idea. Your “Product Test Drive” will save me money on those products that fail, as well as introduce me to new products that do well, but that I was unfamiliar with. Thanks so much. I look forward to your next post! I love this idea. I know beans about a lot of the new products out there and am fascinated by the hammered metal ones. One of your posts inspired me to try Rustoleum’s sea glass paint which I loved. I have streaked hand painted black chalkboard paint, bled under stencils, glued my fingers together with super glue, given myself blisters with hot glue, and had wood to metal come unglued. I’m a prime candidate to watch you try new stuff. I hope you can get companies to “underwrite” some of these projects as you are giving them free advertising! Awesome product. I would love to here your comments about different products ease of use, difficulty level, where to purchase whether online or at big box store. I think it’s a wonderful idea! I love how you tested it 3 different ways, you are brilliant! Those came out great. I am totally ordering that trigger next payday. Is it hard to rinse to use again? I like this idea, please do more posts like this. That’s the plan, Jen- thank you! Yup, count me in too, “the test drive” is a very helpful to the casual upcycle/crafter. I have never seen this paint at any of my local craft or hardware stores. These came of gorgeous, and I love the added turquoise beads. Thank you for sharing your knowledge, talent, and inspiration with us. I love this TEST drive idea! What a great idea and what a cool project! You always come up with ones that aren’t’ too intimidating and that don’t require a lot of power tools! I really love how those turned out, and the added touch of the beads! This is my answer to a vase I have that needs some love. I can’t wait to give it a try. Thank you! Yay!!! As you probably saw in my post, I could only find the paint online, which is why I provided so many links. Happy crafting! Oh good grief! These look fabulous! I had no idea such a thing existed, now I want some really badly! Oh the possibilities. Thanks for the test too, so helpful. You are so welcome, J! And let me know if you ever find it in a store- I tried about 4 different craft/home stores and just had to order it online.